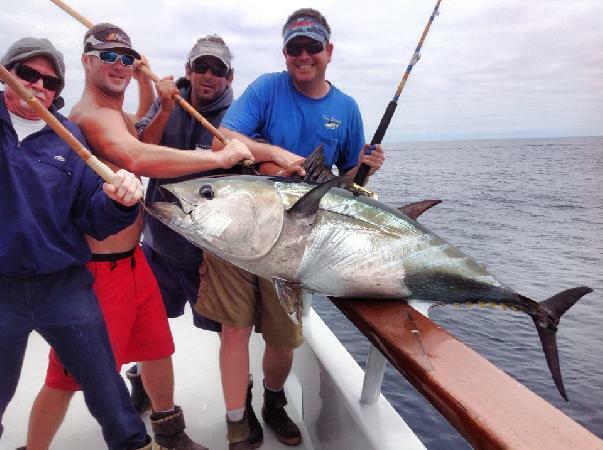 Good morning Anglers, here is a recap on trip#1305, Sponsored by Seeker Rods, and our Charter -master Bryan Porter. Thanks to everyone that came out with us your support is greatly appreciated. Our JP winner on this trip was: 1st place Tom TAMANAHA from GARDENA, Ca. with a 52.6 Yellowtail, 2nd place went to Seth Levine from DURANGO, Co. carrying in a 50.8 Yellowtail . What a story he had to take back to Colorado with him. And 3rd place rolled in was Mike Brennan from MARTINEZ, Ca. a 45.8 BFT...Good job everyone...Once again we want to than all our sponsors and Bryan for all the help you give to the Anglers, your participation in helping on first-timers on-board before yourself is impeccable. See you again Next year.. Jeff and the Indy Crew and Us. Watch us on FB, make your reservations early for 2014, trips are now posted. WOW WHAT A DAY WE HAD.... steady action out of one drift that started at 1300 hrs and went till dark. We had steady 5 to 8 going for hours. The over all grade is a beautiful 30 to 40 lb. and then the 50 to 65 lb.ers. we easily obtained our daily limits and chef Ed Lacombe caught a couple for dinner and sushi .the weather is about as good as it gets out here and looks to stay for a while. With the sign of fish we see here we are going to give this another day. I really have to say, this being the first stop of the trip; everyone did a superb job working together while it was busy. Let's hope this bluefin tuna keeps on the bite. Thanks for checking in on us, Jeff and the Indy crew (Watch us on Facebook) Get in on the Action, a couple spots opened on trip#10. Call the office today or book on line. Independence had "...steady action out of one drift that started at 1300 hours and went till dark July 6. We had steady five to eight going for hours. The over all grade is a beautiful 30 to 40 pounds and the 50 to 65-pounders. We easily obtained our daily limits and chef Ed Lacombe caught a couple for dinner and sushi . The weather is about as good as it gets out here and looks to stay for a while. With the sign of fish we see here we are going to give this another day. I really have to say, this being the first stop of the trip, everyone did a superb job working together while it was busy. Let's hope this bluefin tuna keeps on the bite. Get in on the Action, a couple spots opened on trip #10. Call the office today or book online." There is always a good chance that we could have an early departure. Sign in starts at 7am. Get to the Landing early for parking. Bring your Passport to my office. Slow again for us, we did stop on several nice schools of big BFT for not a lot of action, the fish would either give us the fin and keep going or boil up and then keep going, we did get 1 BF that is about 130 pounds, the 18 to 25 pound yellowfin tuna did keep us a little busy at times also.. Tomorrow is our last day so wish us luck we need it. Banner way to end up!! Hello again everyone, we just finished our 4 day offshore adventure, big fish honors go to John Collis with his 124 lb. Bluefin tuna, 2nd place goes to Douglas Edwards for his 117 lb. 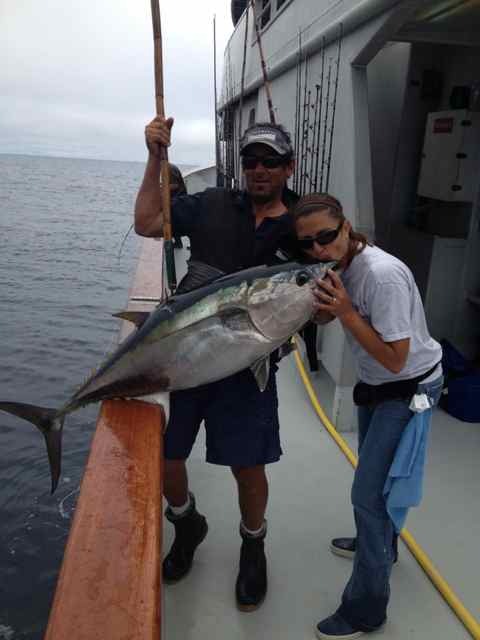 Bluefin tuna caught on 40 lb. Izorline and 3rd place going to Mike Verdugo with a 70.2 lb. bluefin. We had lots of fish in the 60 to 70 pound range with a very solid 60 pound average. Thanks to everyone on the trip. We are now on a six day adventure with another excited group, weather is good and we are currently headed to the BF grounds with high hopes that the fish will continue biting. Thanks for checking in. The Indy gang. Hello from all of us out here on the high seas, we had an excellent day on the 50 to 75 pound bluefin tuna today, 90 percent of the fish are 60 to 70 pounds, just a fantastic grade of tuna we are catching, the weather again was very nice to us. The plan is to stay here and hope to repeat the day we had. We will send some pictures when we can. Have a great day. Mark,Paul,Kevin,Doug,Jesus,Oscar,Ed and Michele. Today was a lot more of fishing than catching, we stayed in yesterday's hot zone to find it ice cold, we did manage (11) 60 to 70 pound bluefin along with a few yellowfin tuna and dorado. We are planning a different approach at angling for tomorrow, the weather has come up a bit and is forecast to blow a little for the next couple of days, that may or may not change our plans. Thanks for checking in. Hello everyone, the weather has taken a turn for the worst on the offshore grounds, with some very nice tuna under our belts we opted for the beach to fish for yellowtail and had two days of steady Fishing on good grade yellows in the 18 to 25 pound range, the weather was a bit on the tough side with 20 to 30 knots most of the time. We are headed up in improving weather and will be in about 6 am Saturday morning. Thanks for checking in, the Indy Staff. Here are some pictures from our current trip. Hello Anglers, Report from Indy will follow soon, they are still fishing..Tomorrows ETA is 7am. Bring your Passports for next trips sign-in. we returned this morning from a very successful Baja paddy hoppers 7 day trip. Thanks go out to everyone who made the trip this year, and to Sherman Lim our host. Jackpot winners for this trip go to John Collins of SAN DIEGO, CA. 51.4 LB. White sea Bass, 2nd place goes to John Keeler of SANTA MONICA 44 LB.White sea Bass AND Randy Britton of LAWTON OK. With a 40lb White Sea Bass. Honorable mention to Jerry Watkins of ARCADIA, Ca. 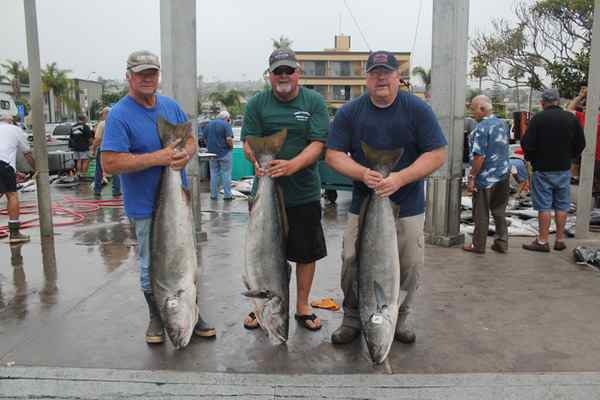 Congratulation guys... we have rick Ozaki from west coast marketing and Avet Reels for our 7- day trip that left today. We have a good supply of sardines and some eager fisherman ready to do battle with what ever we run across this trip. The weather looks to be on our side as well. There are many huge give a ways and raffle prizes being given away as I type this report. Please wish us luck, Jeff and the Indy crew, Matt, Jesus, Doug, Oscar, Phil, Ed and Michele. Watch our Facebook pages for daily updates and pictures throughout the trip. "We returned this morning," wrote Independence skipper Jeff DeBuys July 27, "from a very successful Baja Paddy Hoppers 7-day trip. Thanks go out to everyone who made the trip this year, and to Sherman Lim our host. Honorable mention to Jerry Watkins of Acadia. "Congratulation guys. We have rick Ozaki from West Coast Marketing and Avet Reels for our 7-day trip that left today. We have a good supply of sardines and some eager fisherman ready to do battle with whatever we run across this trip. The weather looks to be on our side as well. There are many huge give a ways and raffle prizes being given away as I type this report."